1. Point K is in which direction with respect to Point N? 2. The office is in which direction with respect to point L? 3. 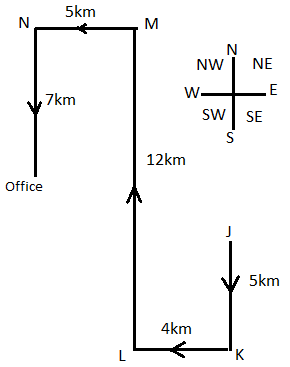 What is the distance between point J and person's office? (i) Each of the four players has a particular style of playing: offensive, technically sound, stylish and perfectionist. (iii) Kohli was most famous for Straight drive. (iv) Neither Raina nor Dhoni were technically sound. (v) The batsman who is perfectionist is famous for his Flick. (vi) Dhoni is famous for Square cuts. (vii) Rahane has an offensive style. 4. Which of the following combinations matches correctly a batsman with his famous shot and his batting style? 6. In a one-day match the captain decides to send the technically sound batsman first, the flicker second, the stylish batsman third and the cover-driver the last. In what order will the batsmen appear? 8. For a match there are three views regarding who should open the innings. The captain thinks that a technically sound batsman should open the innings to give dependability. The other team players want an offensive batsman to open as it will give them a good run rate. The manager thinks that a square-cut specialist should be sent as most of the opening bowlers of the opponents bowl short and around the off-stump. In this case which batsman is most unlikely to open? 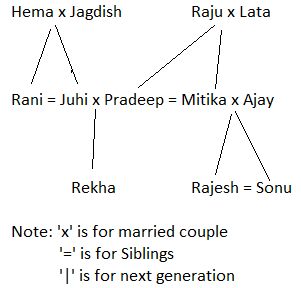 Hema and Jagdish are married couple having two daughters, Rani and Juhi. Hema is an actress and earns her living working in a theatre. Juhi is married to Pradeep, who is the son of Raju and Lata. Raju was a flight attendant while Lata was an Air-Hostess in their youth. Rekha is the daughter of Pradeep. Mitika, who is sister of Pradeep is married to Ajay and has two sons Rajesh and Sonu. 9. What is the relationship between Rekha and Sonu? 10. Which of the following statements is false? a) Juhi is daughter-in-law of Lata. b) Hema is mother-in-law of Pradeep. c) Lata is grandmother of Rekha. d) Ajay is brother-in-law of Pradeep. There are seven persons Anupam, Bharat, Chandni, Dinesh, Rahul, Rajesh and Sumit live in a seven-floor building. The ground floor is no. 1, the floor above it is no. 2 and so on. Rahul does not live on an even-numbered floor. Sumit does not live on the top-most floor. Only one person lives between Rahul and Sumit. Anupam does not live on an even-numbered floor and does not live below Rajesh. Dinesh does not live immediately above or immediately below Sumit. There are two persons between Dinesh and Rahul. Both Chandni and Bharat do not live on an odd-numbered floor. There are two floors between the floors on which Sumit and Chandni live. Rajesh lives on floor number 5. 11. Anupam lives on which floor? 12. How many persons live between Dinesh and Rajesh? 13. Who among the following lives on the floor number 2? 14. How many persons live between Anupam and Sumit? 15. If Chandni interchanges his floor with one who lives on the floor number 2, then who among the following lives exactly between Dinesh and Bharat? 5. A) From the above explanation, it's clear that the Cover drive hitter and the offensive batsman both is Rahane and therefore the suggested replacement is not possible. 8. C) It's evident from the explanation that except Raina any of the other three batsmen can be chosen as an opener.